We’re on the cusp of the genesis of a new category of business travel, the ultra-short-haul market. Urban congestion is driving innovators to reach for the stars or at least as high as the layer of underutilised airspace sandwiched between the rooftops and the altitude beneath commercial airline traffic. The premise is that to alleviate gridlocked city traffic there’s going to be a growing need for on-demand airborne vehicles so business travellers can get around quickly, summoning a ride with a tap on their smartphones. Flying taxis will take off and land vertically from skyports dotted around town, on top of office buildings and at publicly accessible spaces. Sure, helicopters have been around for decades, but they’re noisy, pricey and devour tons of fossil fuel. What’s about to take off promises to transform the economics of urban business travel while ticking the environmental boxes too. There are more than 40 smallish vertical take-off and landing aircraft, most of them electrically powered, known as eVTOLs, at various stages of development. Some are the progeny of major aircraft makers. Airbus, for example, has been designing and testing flying taxi prototypes including its self-piloted, or autonomous, Vahana and the four-seater CityAirbus. But most of what’s happening in this innovative skyscape is outside the conventional aircraft manufacturing hubs. The startling thing is that you no longer need to be an established planemaker to develop urban flying taxis. What you do need, however, are investors. “From an investor’s perspective, I can offer what we’re experiencing in XTI. This is mainly a realisation that things are indeed changing in aviation – that barriers to entry are coming down,” says Robert LaBelle, chief executive of XTI Aircraft Company. The firm is bringing to market the Tri-Fan 600, the world’s first hybrid-electric commercial VTOL aircraft, which will have a 670-nautical-mile range and travel at 300 knots, with capacity for a pilot and five passengers. “Advancements in electric motors, generators, controllers, batteries and other components that facilitate new propulsion systems preclude the need to develop bespoke machinery, which then must be certified,” says Mr LaBelle. This results in a faster, less expensive path to new aircraft design and production claims. “With so many new companies cropping up to validate this fact, smart investors are seeking opportunity to get in early and place bets on the ones they believe have the best overall chance of success,” he says. XTI has taken deposits for 60 early production aircraft and expects to have at least 200 orders by the time production begins. Other contenders in this space include Terrafugia with its TF-X plug-in hybrid electric flying car with semi-autonomous flight, and the TF-2 with detachable passenger and cargo pods. Terrafugia was set up by five award-winning Massachusetts Institute of Technology graduates in 2006 and generated much media attention when it was acquired last November by Zhejiang Geely Holding Group, owners of Volvo Cars and also the London Taxi Company. 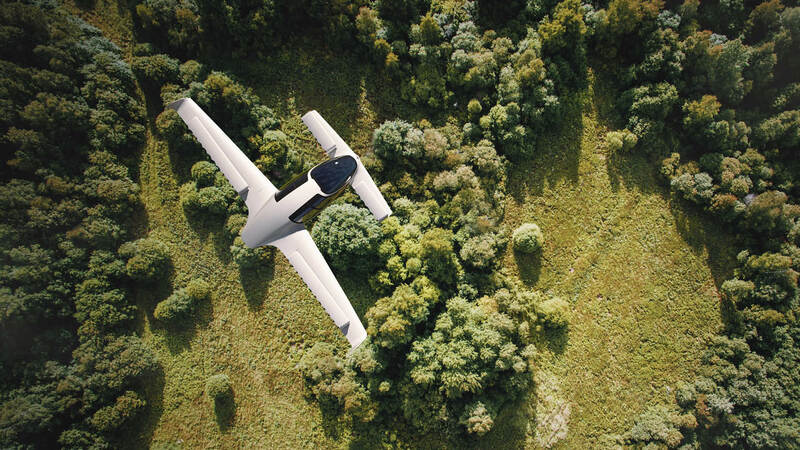 Another challenger in the eVTOL arena is Germany’s Lilium, whose five-seat Lilium Jet promises to “bring low-cost air travel to a mass audience at a price comparable to ground transport”. The company claims its aircraft will make the 19km hop from Manhattan to JFK Airport in as little as five minutes. Investor appetite for vertical eVTOLs is being turbocharged by a specific initiative from urban mobility’s biggest disruptor, Uber. Earlier this month, Uber hosted its second annual Elevate Summit in Los Angeles, where vehicle manufacturers, regulators, investors, suppliers, and federal and local policy-makers convened to explore the exciting future of urban aviation. The summit follows Uber’s Elevate report, published in October 2016, which set out a blueprint for an on-demand urban mobility ecosystem, outlining the market feasibility, certification processes, technologies, air traffic control, safety and environmental criteria – just some of the challenges ahead. It has certainly captured investors’ attention, but will they jump aboard? According to Uber, in the last year “over $1 billion of private sector investment has already been made in the on-demand aviation ecosystem, supporting several high-profile VTOL fundraising events and aerospace M&A activity”. But with dozens of eVTOL startups competing for the attention of speculators, how much of an expert do prospectors need to be when the technology is so nascent? Do investors need a doctorate in aeronautical design or autonomous control systems before they have the confidence to reach into their pockets? At the Uber summit’s panel session on investment opportunities in urban air mobility, a cadre of investment dragons from the worlds of global private equity, venture capital and institutional investment pondered this and other conundrums. “The questions are what is the operational cost of the vehicle? Does it fit a mission profile that makes sense? How do you intend to build it and service it? What’s the regulatory landscape and why are people trying to build these vehicles?” says Maryanna Saenko, venture investor at Draper Fisher Jurvetson. Ms Saenko says investors really want to work with teams where you can understand their form of logic and how they’re going to work through future issues. “One of the frustrations I have is not that there’s an expectation that whatever model a startup company presents has all the correct numbers, it’s what are the assumptions and therefore can I follow your sense of rationale,” she says. Another expert on the summit’s panel believes on-demand ultra-short-haul flights are a logical progression in the evolution of urban business travel. “We believe in the sharing economy and the development of dense transportation networks that will include eVTOL technology, so we’re a huge believer behind the macro-trend that drives this ecosystem,” says Michael Ronen, managing partner at Softbank Investment Advisers. Until recently, flying taxis might have seemed like the stuff of science fiction. But as long as getting across town becomes more burdensome, and with investors entranced by the prospect of being early to market in backing the right bits of the eVTOL ecosystem, the skylines of our cities could soon look very different. Previous article We may be ready for autonomous cars, but how about self-driving bikes?